This issue of Hydro International is focused on Inland Water Mapping and includes a Technology in Focus on GNSS Receivers. You will find articles on this subject in addition to the regular columns. Do you like it better to have the magazine in your hands? Get the print edition! Technology in Focus: GNSS Receivers (p. 30). Page 16: Hydrographic surveying in ultra-shallow, inland and enclosed waters can prove extremely challenging and often presents increased risks and obstacles to both personnel and equipment. These considerations include health and safety issues, potential damage to equipment, lack of suitable launch sites and regions where submerged debris and physical seabed characteristics can make an area particularly hazardous to survey. In these locations, traditional manned survey vessels are often unsuited, inefficient, or incapable of completing a successful survey. In November of last year, Unmanned Survey Solutions, with support from Swathe Services, were tasked with completing a hydrographic survey of such an area. Read now. Page 22: Knowing the volume of material present in a gravel quarry can make the difference between profit and loss. A gravel quarry in Hartheim am Rhein, southwest Germany, is partially covered by artificial lakes. To determine the volumes of the above-water gravel dumping grounds and to map the bottoms of the lakes, high-precision data captured by an unmanned aerial system (UAS) was combined with multibeam echosounder data obtained by boat. Read the full article for a description of acquisition of the two types of data, how they were integrated and the benefits for the mining company. Read now. 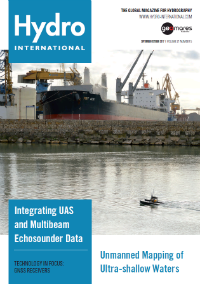 Page 26: Interferometric sonar acquire millions of soundings in a hydrographic survey. The processing of this data by a hydrographer without a reliable statistical algorithm like CUBE (Combined uncertainty and bathymetry estimator), to obtain a bathymetric map, would be practically impossible. CARIS HIPS software allows the use of the CUBE algorithm, invented by Dr Brian Calder, with an editable XML file to process the millions of soundings acquired in a survey. A good adjustment in the values ​​of these parameters improves the outcome of the CUBE model, obtaining a seafloor as close to reality as possible. The values ​​of these parameters mainly depend on the working depth, the roughness of the seafloor and the equipment used. Read now. Page 30: GNSS has now been operational in the surveying industry, and especially in hydrography, for more than 25 years. Where the first receivers such as the Sercel NR103 (once the workhorse of the industry) boasted 10 parallel GPS L1 channels, current receiver technology has evolved to multi GNSS, multi-channel and multi-frequency solutions. In this article, we will look at the current state of affairs and try to identify the areas where development can be expected in the years to come. Read now.